Presented as part of the 2016 Next Wave Festival, Under My Skin is a new dance/performance piece that explores how we choose to present ourselves to the world and to consider the things we prefer not to reveal. However, what makes Under My Skin stand out from any other show is that the company behind this, The Delta Project, use both deaf and hearing dancers in its productions. With that in mind, there are visual and lighting cues for the four dancers (Anna Seymour, Amanda Lever, Luigi Vescio and Elvin Lam) to follow, but there were no discernible moments where I was able to notice these occurring, as all the dancers seemed to be intensely in tune with the movements of each other and of their own bodies. There was a definite sense of trust among them, which allowed the emotive choreography by Jo Dunbar and Lina Limosani to work so well among the dancers and make their performances all the more powerful. 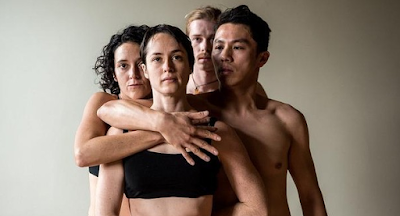 The four begin huddled together in a tight embrace while new media artist Rhian Hinkley‘s projections of images of the dancers’ faces are displayed on the wall behind them. With the dancers positioned directly in front of the projection, parts of the images appear on them, creating an unsettling feeling: a sense of vulnerability and dependency. Gradually, they break apart into their own space, but throughout the performance they always remain connected in some way, either literally or figuratively. There is an interesting montage at one point where the expression “clothes make the man” came into mind, with Vescio standing in the middle of the stage with the other dancers circling around him, adding selected items of clothing or accessories to his body one at a time. Vescio would take on personas and continue to evolve and change with every item taken and added, playing with the idea of how easy it is to change how the outside world perceives us through our appearance and actions. However, the moments where the large rectangular boards are pushed around the stage by the dancers, whilst creating an effective black and white visual, were ultimately distracting, taking me out of the emotion with which I was trying to remain engaged. Under My Skin is an adventurous dance production that definitely pays off for company co-founders, Seymour and Dunbar. While there are moments that were more difficult to engage with than others, it is a great example of how being accessible doesn’t mean losing creativity or lessening the experience for all involved. Hopefully with this show, The Delta Project will inspire other companies and theatre makers to make shows that are accessible to both diverse audiences and diverse performers.